As the Lost Generation struggled to move past the devastation of The Great War they embraced massive social change. Jazz, movies, and technological innovation whirled with gangsters, prohibition, and political upheaval. By the end of the decade Black Thursday would usher in the Great Depression and the world would grow steadily darker. But this was just the beginning. 1920: The Roaring Anthology includes five loosely connected short tales of action, mystery and suspense. Wally Pendleton imagined a life of fame and importance yet, somehow, he found himself – and more – as a mundane census worker. Great War veteran Charlie Clerk returns to the battlefield to confront an all too familiar enemy lurking in the abandoned trenches and bunkers of Europe. The Keystone Kops might be masters of physical comedy but it’ll take more than trips and slips for professional slapstick Chuck Cooper to solve a real life Hollywood murder. The vigilante Poltergeist is the scourge of the underworld – literally! 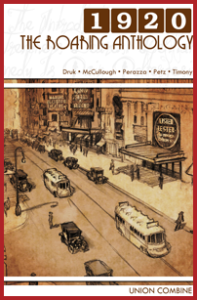 Gangsters and the great unknown collide in the streets of New York City on the brink of eldritch horror. Jack might be crazy but before he tried to kill himself he needed to explain to Delilah exactly why it wasn’t suicide. Hopefully.